Step 1: Set the height of the knee pad so that you can slide your legs under it and it will still keep your body anchored down. Grap the handle with one of your hands using a pronated grip(palms facing away from your body). Step 2: Exhale and pull the handle down slowly, while squeezing your shoulder blades together and pull your elbow back and down to your side as while flexing your lats. Step 3: Hold the weight with your arm in the bottom position for one to two seconds. Now inhale as you slowly return the handle up to the starting position. Repeat for the desired number of repetitions. For maximal results do not fully lower the weight to keep consistent tension on your muscles. Since this exercise uses such a basic movement pattern, it is suitable for people at a beginner to advanced fitness level. If you are new to lifting, it will be more of a benefit for you to use traditional pull-ups, chin-ups and bent over rows to build up your lats and biceps for at least the first six months. However, if you have an imbalance between sides or have been exercising for a while and want to target your lats, this is one of the best exercises there is. To perform this exercise, you will need access to a cable machine and ideally a D handle attachment. If you do not have access to a cable machine, then you can replicate the movement by using a resistance band attached to a sturdy base. Also, this movement comes from the action we use when pulling our body up. So you can also perform some traditional pull-ups to get your lats built up. The Primary muscle worked by the Single-Arm Pulldown are your Lats. 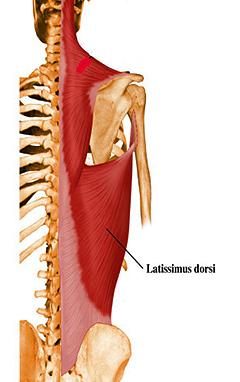 These are the large muscles that run along the side of your back. The secondary muscles involved are your Biceps and Forearms. Depending on the way your hands are positioned will determine precisely how the secondary muscles get targeted. If you use a supinated grip (think chin-ups), your biceps are more involved in the movement. With an overhand grasp, more of the outer head of the bicep gets recruited. Since the Lats are such a large upper body muscle, it provides an opportunity for some serious growth potential. Building Strong Lats has been shown to increase the amount of weight you can lift on Deadlift, Squats and even your Bench Press. That's right your bench press can actually go up significantly when you build yourself up a big sturdy back. Strong Lats also help you to keep your shoulders, hips, lower and upper back healthy. Using the one arm variation is a great way to help make sure your lats are symmetrical. Using unilateral (single side) training can help you to create optimal symmetry and remove any imbalances between the two sides. Performing the lat pulldown single handed allows you to use a full range of motion not possible with a long bar enabling you to target your lower lat muscles better. You can use an overhand or underhand grip when performing this exercise. Using an underhand grip target your biceps more and an overhand grip will slightly help incorporate the lower portion of the lats marginally better. If you find your biceps are giving out before your back, you have two options. The first is to use an underhand grip. Most people find that they can perform more repetitions when they are using this grip. The second is a tip I picked up from Jeff Cavaliere. It will help you to provide a better stretch to the lats, and it only requires one small, simple alteration to our setup. We are going to change the way that we sit at the cable station. We are now going to be sitting off to one side. Place your left knee anchor into the bad. Your right leg will not be under a pad but off to the side. Now shift on to your left creating a side bend in your body. Now as you pull down you will get a stronger contraction because the muscle is in full stretch. Also, now you are also going to rotate back in the opposite direction creating a stronger contraction to the lats at the bottom. Honestly, this alteration works your lats so well that even if your biceps are not giving out on you its worth trying this way to see just how well this way directly targets your lats. If you want to place a higher focus on the middle of your upper back then just lean your body back by approximately 45 degrees when you are performing the pull. Use a slow and controlled movement the entire time. When you jerk the weight you lats perform minimal work. When you jerk the weight, your lower back and bicep are used instead of the lats, when this happens, it increases your chance of receiving an injury. Building a strong back with a nice V look takes hard work proper diet and the right exercises. If you have been ignoring your lats, many of your other compound lifts are also going to suffer. It does not matter if you are pushing, pulling, or performing squats a strong back will make sure you can move an impressive amount of weight.